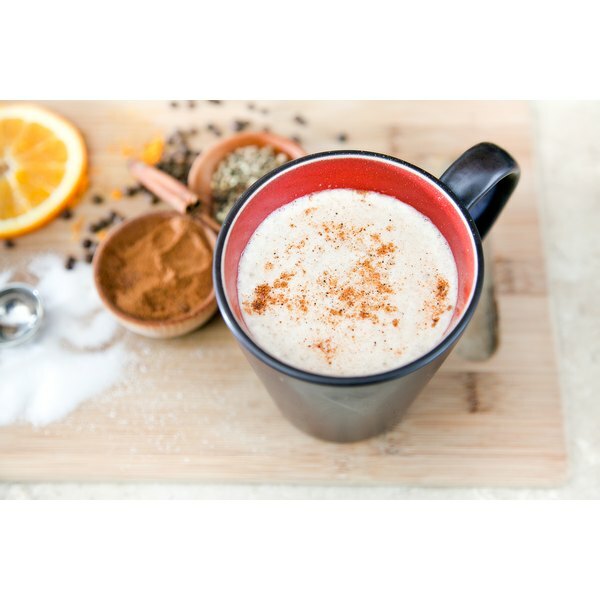 Chai tea is a mixture of aromatics and spices combined with steamed milk to make a warm beverage. Visiting your local Starbucks for a chai tea latte may be a pleasurable experience, but if you do it regularly, it can also be costly. To lessen the strain on your budget, you can make your own chai tea at home from scratch or from a commercially blended mix. With practice, your at-home tea can taste the same as or really close to the Starbucks version. Add the milk and water to a saucepan and heat over medium-high heat. Cook the milk mixture until it is warm, but do not allow it boil. If it begins to boil, remove it from the stovetop. Place the orange peel, cloves, cinnamon stick, peppercorns, a pinch of nutmeg, white sugar and tea leaves into the milk mixture. Bring the tea mixture to a light boil and reduce the heat to medium-low. Cook the tea mixture for approximately three minutes. The color will darken as it cooks; the darker the color, the more concentrated the flavors will be. Remove the tea mixture from the heat when it reaches the color of your choice. Place the strainer or colander over a cup and pour the tea into it to remove the spices. Use a small milk frother to create foam on top of the chai tea latte. For best results, position the milk frother at the top of the latte rather than submerging it in the milk. Serve and enjoy. Combine the milk and water together and heat them in a saucepan set over medium-high heat. Add 1 to 2 tbsp. chai tea mix to a cup. Heat the milk mixture until just before it begins to boil. Remove it from the heat. Pour the hot milk mixture into the cup and use a spoon to stir the mixture gently. Use a milk frother to create foam on top of the chai tea latte. To make an iced chai tea latte, allow the chai tea mixture to cool and pour it over a glass of ice. What Are the Benefits of Turmeric With Milk?